Pegasus Mail is one of the most powerful and secure email clients available for Windows, but the interface could need some polishing to make its features more accessible. The project of developer David Harris, Pegasus Mail and its counterpart, the Mercury Mail Transport System, are free to use, with no registration limitations or ads to diminish the experience. Pegasus Mail dates to the days of MS-DOS in the mid-1990s. For a quarter-century, Harris has maintained this email program. Although it's not the most gorgeous email client on the market, it does have a loyal user base and a well-considered, rock-solid architecture. Pegasus Mail offers a substantial number of features, including native spam filtering, a robust address book, multilanguage support, spell checking, and an HTML display engine. The program supports several POP and IMAP accounts, multiple identities, and more than one user. The program's internal spam filtering, which works well and is easy to use, relies on Bayesian techniques to analyze and predict the probability that a given message is junk. It generally performs quite well. Pegasus Mail supports end-to-end encryption technologies as well as a collection of plug-ins; importantly, it supports SSL/TLS for secure connections to email servers. The program is well-supported by the author, who maintains an active community site for dedicated users. A comprehensive help system aids you in making use of Pegasus Mail's amazing abilities, but the interface is often crude and the functionality scattered. Pegasus Mail has one of the most flexible filtering and template systems (for canned replies) found in any email client; it comes with an encryption engine for secure email built-in and lets you set up mailing lists and newsletters using mail merging. A filter wizard helps you build rules from examples in a smart manner. People who like to customize how messages are grouped and displayed will appreciate options to group by thread, sender, date, and similar criteria. The application's interface shows its age. Pegasus Mail appears to be straight out of 2009, with a Windows XP-style display emphasizing buttons and menus. The program's powerful features could be more obvious to access; modern users are accustomed to programs that rely on flatter visual elements. The message editor, while powerful, isn't perfect. It relies on older HTML-rendering technology and feels a few generations old. Similarly, search works well—but it's frustratingly slow on larger mailboxes. Pegasus Mail does not include virtual folders or labels that would learn by example. If you're accustomed to your email program realizing that you put all your emails from your spouse into a "family" folder, for example, and then shortcutting that move, you'll be disappointed in the inflexibility of Pegasus Mail to automate these tasks for you. 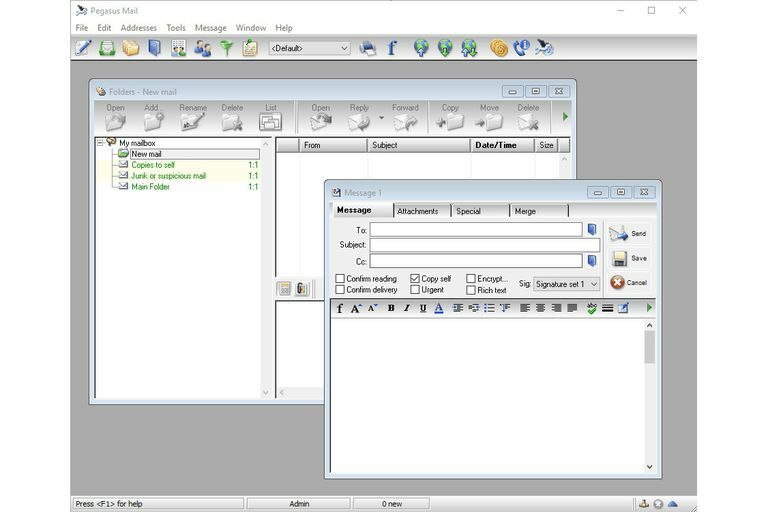 MMTS runs on Novell and Windows servers; it's a full-featured server solution that works with Pegasus Mail. Although MMTS isn't required to use Pegasus Mail, the DOS version of the email program requires the server to run, given that MS-DOS did not support internet technologies for email transmission.